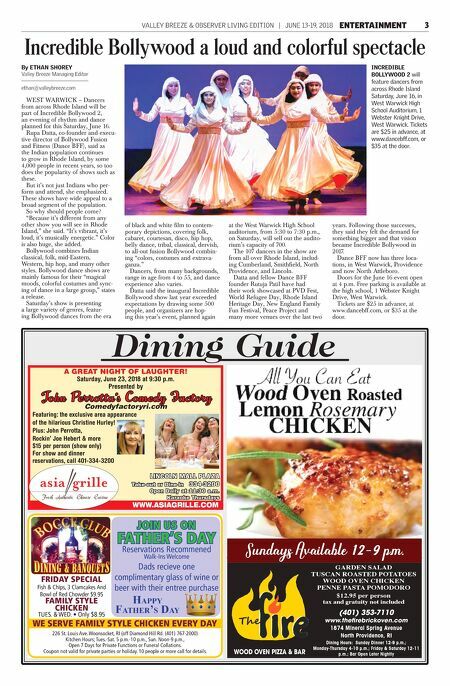 VALLEY BREEZE & OBSERVER LIVING EDITION | JUNE 13-19, 2018 ENTERTAINMENT 3 WEST WARWICK – Dancers from across Rhode Island will be part of Incredible Bollywood 2, an evening of rhythm and dance planned for this Saturday, June 16. Rupa Datta, co-founder and execu- tive director of Bollywood Fusion and Fitness (Dance BFF), said as the Indian population continues to grow in Rhode Island, by some 4,000 people in recent years, so too does the popularity of shows such as these. But it's not just Indians who per- form and attend, she emphasized. 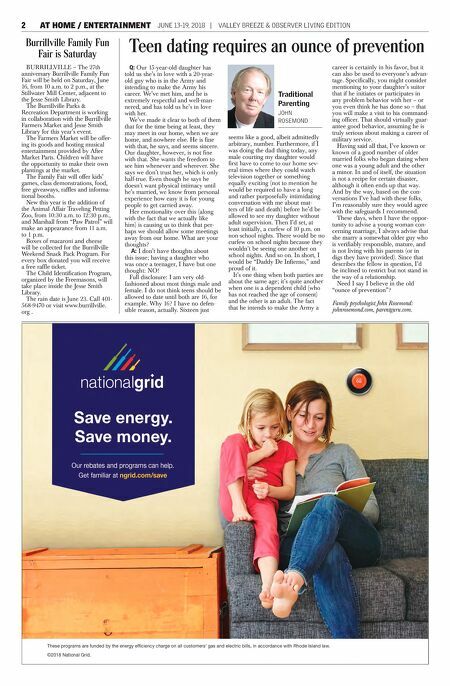 These shows have wide appeal to a broad segment of the population. So why should people come? "Because it's different from any other show you will see in Rhode Island," she said. "It's vibrant, it's loud, it's musically energetic." Color is also huge, she added. Bollywood combines Indian classical, folk, mid-Eastern, Western, hip hop, and many other styles. Bollywood dance shows are mainly famous for their "magical moods, colorful costumes and sync- ing of dance in a large group," states a release. Saturday's show is presenting a large variety of genres, featur- ing Bollywood dances from the era of black and white film to contem- porary depictions, covering folk, cabaret, courtesan, disco, hip hop, belly dance, tribal, classical, dervish, to all-out fusion Bollywood combin- ing "colors, costumes and extrava- ganza." Dancers, from many backgrounds, range in age from 4 to 55, and dance experience also varies. Datta said the inaugural Incredible Bollywood show last year exceeded expectations by drawing some 500 people, and organizers are hop- ing this year's event, planned again at the West Warwick High School auditorium, from 5:30 to 7:30 p.m., on Saturday, will sell out the audito- rium's capacity of 700. The 107 dancers in the show are from all over Rhode Island, includ- ing Cumberland, Smithfield, North Providence, and Lincoln. Datta and fellow Dance BFF founder Rutuja Patil have had their work showcased at PVD Fest, World Refugee Day, Rhode Island Heritage Day, New England Family Fun Festival, Peace Project and many more venues over the last two years. Following those successes, they said they felt the demand for something bigger and that vision became Incredible Bollywood in 2017. Dance BFF now has three loca- tions, in West Warwick, Providence and now North Attleboro. Doors for the June 16 event open at 4 p.m. Free parking is available at the high school, 1 Webster Knight Drive, West Warwick. Tickets are $25 in advance, at www.dancebff.com, or $35 at the door. Incredible Bollywood a loud and colorful spectacle By ETHAN SHOREY Valley Breeze Managing Editor ethan@valleybreeze.com INCREDIBLE BOLLYWOOD 2 will feature dancers from across Rhode Island Saturday, June 16, in West Warwick High School Auditorium, 1 Webster Knight Drive, West Warwick. Tickets are $25 in advance, at www.dancebff.com, or $35 at the door. Dining Guide WWW.ASIAGRILLE.COM LINCOLN MALL PLAZA Take-out or Dine-in 334-3200 Open Daily at 11:30 a.m. Karaoke Thursdays A GREAT NIGHT OF LAUGHTER! Saturday, June 23, 2018 at 9:30 p.m. Presented by John Perrot ta's Comedy Factory Comedyfactoryri.com Featuring: the exclusive area appearance of the hilarious Christine Hurley! Plus: John Perrotta, Rockin' Joe Hebert & more $15 per person (show only) For show and dinner reservations, call 401-334-3200 We serve FaMILY sTYLe ChICKeN everY daY FrIdaY sPeCIaL Fish & Chips, 3 Clamcakes And Bowl of Red Chowder $9.95 FaMILY sTYLe ChICKeN TUES. & WED. • Only $8.95 226 St. Louis Ave. Woonsocket, RI (off Diamond Hill Rd. (401) 767-2000) Kitchen Hours; Tues.-Sat. 5 p.m.-10 p.m., Sun. Noon-9 p.m., Open 7 Days for Private Functions or Funeral Collations. Coupon not valid for private parties or holiday. 10 people or more call for details. Happy FatHer's Day Reservations Recommened Walk-Ins Welcome Dads recieve one complimentary glass of wine or beer with their entree purchase JoIN Us oN FaTher's daY GARDEN SALAD TUSCAN ROASTED POTATOES WOOD OVEN CHICKEN PENNE PASTA POMODORO $12.95 per person tax and gratuity not included WOOD OVEN PIZZA & BAR (401) 353-7110 www.thefirebrickoven.com 1874 Mineral Spring Avenue North Providence, RI Dining Hours: Sunday Dinner 12-9 p.m.; Monday-Thursday 4-10 p.m.; Friday & Saturday 12-11 p.m.; Bar Open Later Nightly Sundays Available 12-9 p.m.